On Wednesday, I was asked to step in as the Chat and Challenge Hostess on SUDSOL (Simply Unique Demonstrators Share On Line). SUDSOL is a paid demonstrator group that is worth EVERY penny. There are business tips, an AWESOME gallery, super secret forms to which only SUDSOL members have access. In short, it's DA BOMB!! Anyway, I'm the coordinator for the Chat and Challenge and sometimes, when someone can't host their time slot, I step in. While at Regionals in Hamilton a couple weeks ago I received a swap card from the lovely and talented Liz Goldhawk. 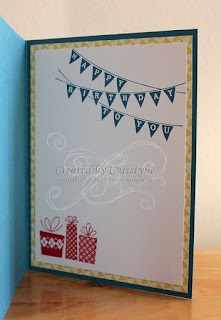 I didn't have the stamp set she used, but I did CASE her design for the Chat and Challenge. I used Elements of Style and I just LOVE the way it turned out...right down to that SUMMER STARFRUIT - LOL! 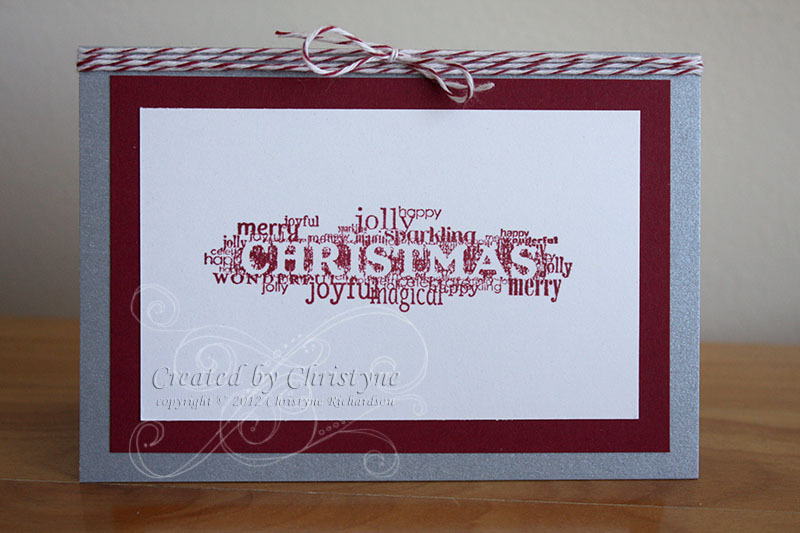 This is a CAS (Clean and Simple) card with minimal stamping, LOTS of white space and not a lot of layers or extra bits and pieces. In fact, if I'd done what I had in my head, there wouldn't even be the Word Window Punch layer as I wanted to stamp the sentiment on the bottom panel. Of course, I got all excited and added the Stampin' Dimensionals to the back of the panels and well...yeah. It's nearly back to SPOOL time! Yep! You read that right! 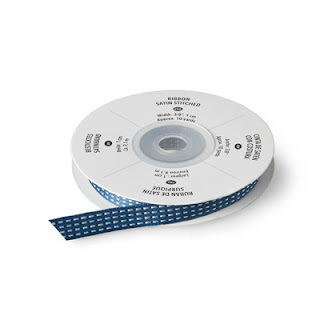 Back to SPOOL!!! Beginning September 1st, Stampin' UP! will have a special offer whereby you can get a FREE spool on the 2012-2014 In Colour ribbon! Which will YOU choose??? Come back on September 1st for ALL the details! Cheers to the Paper Craft Crew! When I first saw today's sketch, I thought, "Happy I do Day" because I knew it would fit in the circle AND it's mine and DH's wedding anniversary on Friday. But then, I started thinking of bright colours since I had them out from yesterday's card. I started off with the leftover Pacific Point from yesterday and then consulted my colour coach to add the Pumpkin Pie and Melon Mambo. I stamped the glass in Pacific Point on Whisper White and then punched it out, leaving enough space at the top for the little umbrella, which was (yes, I'm crazy!) hand cut. Then, I added a slit to the rim of the glass and tucked the umbrella in. 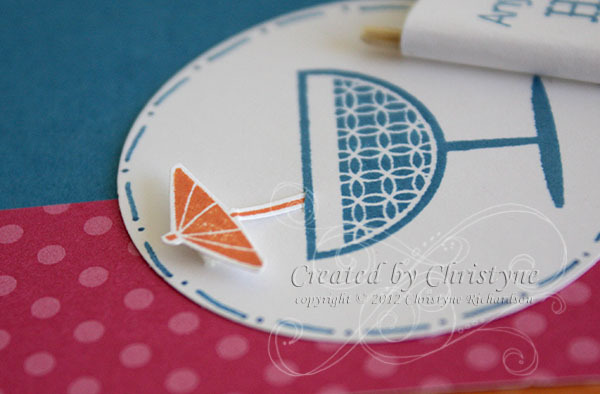 I added a Stampin' Dimensional under the umbrella. 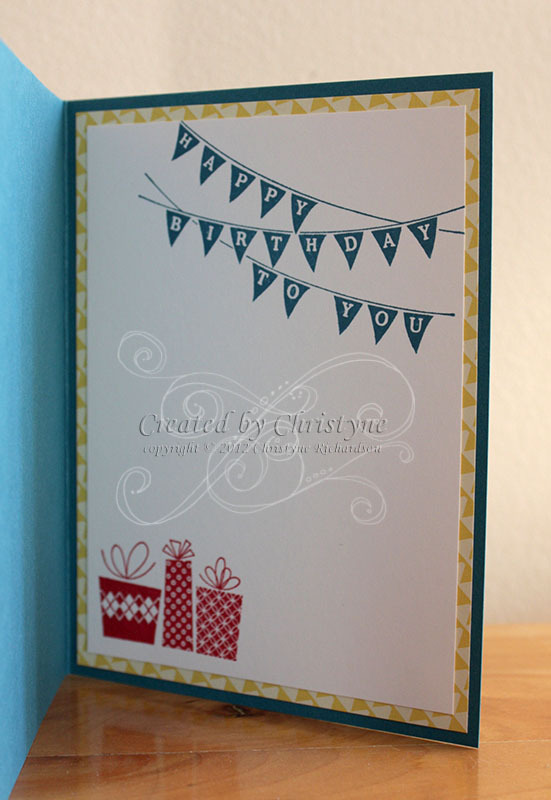 I stamped the sentiment in Pacific Point and notched one end. Then, the idea of a martini came to me and I wrapped the other end around a toothpick (I cut off the pointy ends) for a nod to the "olives". 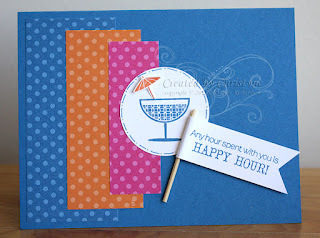 I do hope you'll play along with us this week at the Paper Craft Crew! Let's go Make a Cake! OK, I was TOTALLY singing, "Let's go fly a kite..." as I was typing that. Yeah, I know. I'm a little (a lot?) weird like that - LOL! 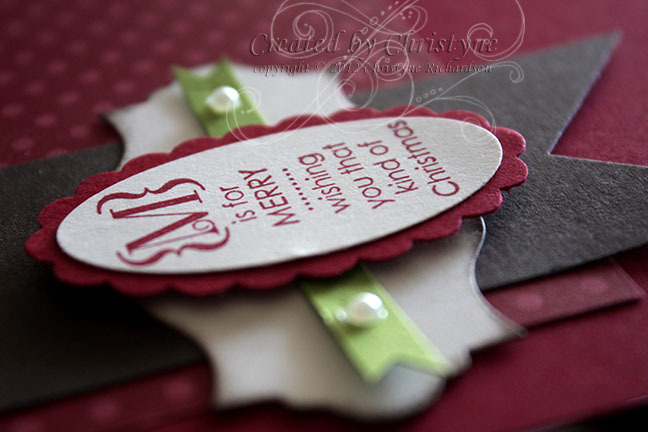 As you know from this post, I was trying out for the CAS Design Team on SplitCoast Stampers. I'm pleased to tell you that I was chosen as one of the TOP 12!! The top 12 were asked to create a card based on two inspiration photos. The photos were party themed and had banners in them. When I saw the inspiration pieces, the first thing that came to mind was the "Make a Cake" stamp set. I learned a LONG time ago that the first thing I imagine is usually the RIGHT thing, so I went with it! 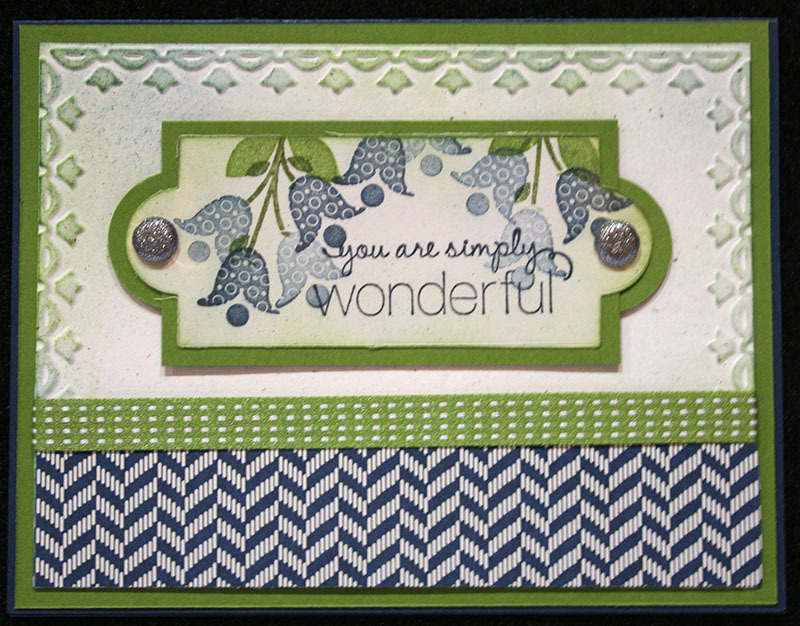 I used my Stamp-a-ma-jig to make sure everything was lined up correctly and stamped my image with Pacific Point, Melon Mambo and Tempting Turquoise. I added the cute little butterflies after the cake was stamped. I briefly considered using Teeny Tiny Wishes for my sentiment, but decided to go with the "Happy Birthday" from Itty Bitty Banners instead. I'm glad I did. I think it's just PERFECT! I'll let you know on Friday if I was successful in making the team! Yeah, I know...weird title - LOL! But, the two cards I chose for today are from two sets with those words in their names. I just love how cute this set is! 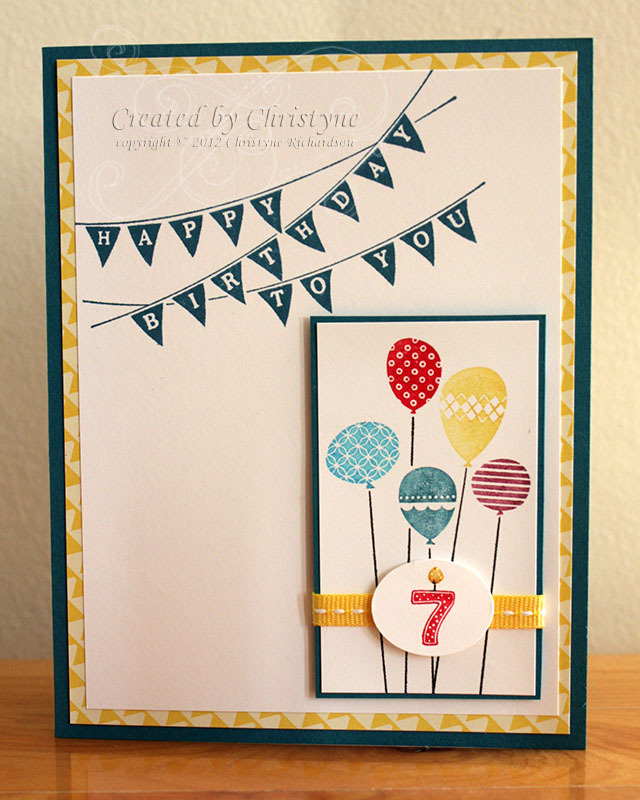 The perfect little boy card in MINUTES! This card is what's knows as a "hybrid" card. It's created in My Digital Studio, printed and embellished with accessories, to give it some texture. I particularly loved this one because it showcases the "colour change" feature in MDS2. 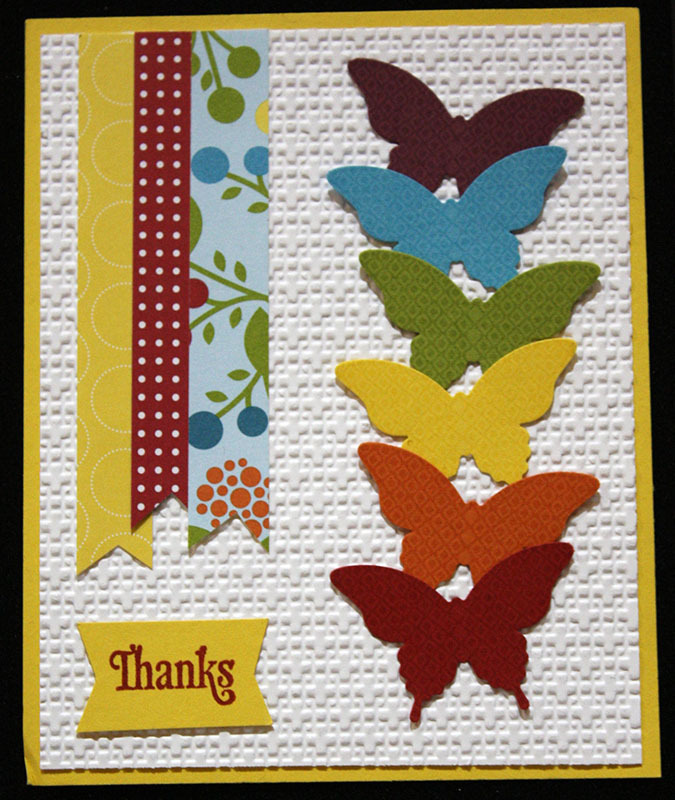 With this feature, you can colour one stamp in many different colours. Too fun! Thanks for visiting Hamilton with me again today! Did you enjoy yesterday's cards? I certainly hope so, because I've got some more for you today! Isn't this just happy and cheerful? That's why it caught my eye! I just love the simplicity of adding a bunch of circles to an embossed panel. And that tiny little bejewelled flower? The perfect touch! Some more happy and cheerful! The tone on tone butterflies just made my day! The new elegant butterfly punch is perfect for adding...well...a touch of elegance! The last card for today is using what's sure to become my very favourite two step stamping set. When Stampin' UP! retired two of my favourite two step stamping sets last year, I was devastated. But then...they gave me Stippled Blossoms and I was HOOKED!! I just love how pretty and elegant this set is. I'll bet you love it too! 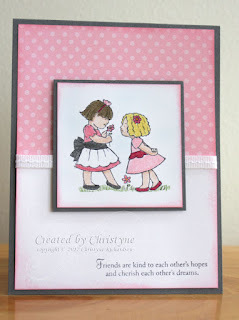 As you know from this post, I'm trying out for the CAS Design Team on SplitCoast Stampers. The most recent challenge is to use three of our favourite things (not including paper and ink) on a card. 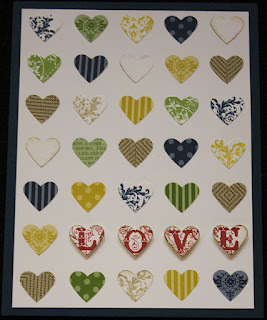 My choices were: two-step stamping, fussy cutting (bet you NEVER would have guessed!) and Stampin' Dimensionals. I stamped the image first in Pool Party and then used my Stamp-a-ma-jig to over-stamp in Island Indigo. I did the same with the leaves, using River Rock and Always Artichoke. The Always Artichoke was stamped off because I found it a bit too dark against the River Rock. 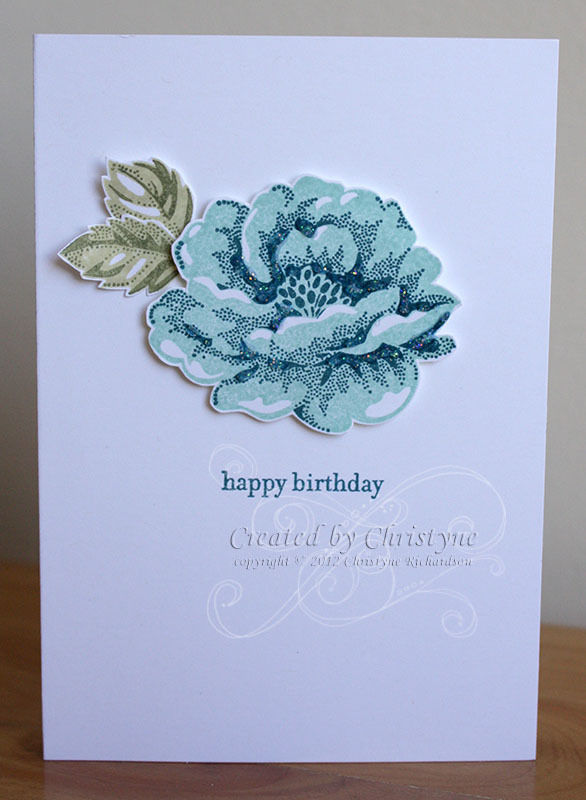 I fussy cut both the flower and the leaves and then adhered the flower with Stampin' Dimensionals. The leaves got just the teeniest dot of Mono-Multi glue. 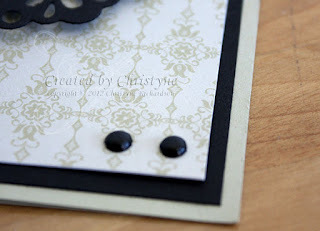 I wanted them on a different "level" so didn't use Stampin' Dimensionals, but I didn't want them completely stuck down. So, Mono-Multi was the solution. 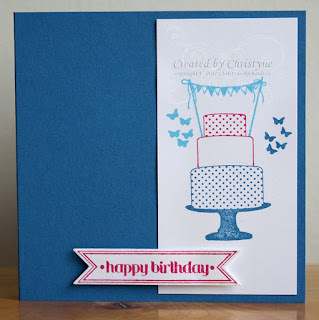 Last but not least, I stamped the sentiment from Teeny Tiny Wishes just below the blossom in Island Indigo. 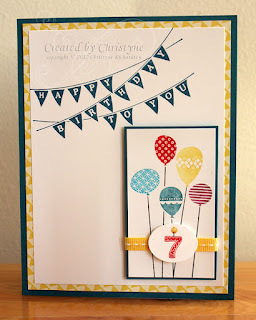 Last weekend, I had the privilege of attending one of the amazing Stampin' UP! Regional events in Hamilton, ON. It was a fun filled day with swaps, make and takes, demonstrations and just a general happy feeling! One of the highlights of Regionals (and really ANY Stampin' UP! event!) is the amazing display boards. Over the next few days (weeks?) as I try my best to be compliant and let my elbow heal, I'll be sharing some of the photos from the event. Ready? The display boards are always one of my favourite things to see, so I'm going to start with those. There were dozens of card and scrapbook samples to photograph, so these are just a few of them. This first sample caught my eye because I'm enthralled with this set. I don't own it (yet! ), but those that do can do AMAZING things with it! 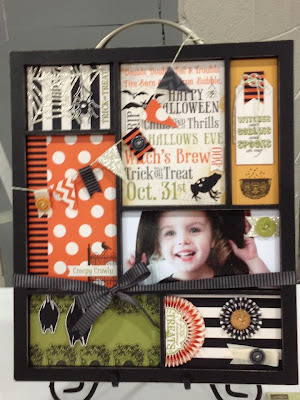 I just love the way the large image panel was stamped and then run through the Big Shot with the Lattice Embossing Folder. My last sample for today features the Scentsational Season set. 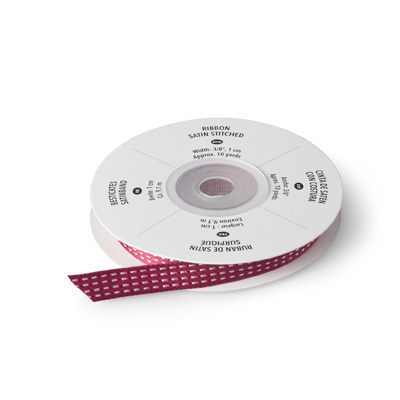 What a GREAT way to use up ribbon scraps! I know we all have LOTS of those. And how easy too...just run one piece of Crumb Cake Cardstock through the Big Shot with all three framelits at once. It couldn't be easier! Join me tomorrow for some more pictures! Because one Design Team is not enough! Yesterday, I was hanging out on SplitCoast Stampers checking out the boards and the gallery. I decided to hunt down the CAS (that's Clean and Simple) challenge for this week and came across the Design Team call challenge! I thought, "why not?" and got to work. The first challenge was to create a card using the colours of our favourite sports team. Now, I could have used the Green, White and Red of my Italian boys, but the first thing that popped into my head was the New England Patriots, so I decided to go with that. I'm not a huge sports fan, but I do enjoy a good Super Bowl! 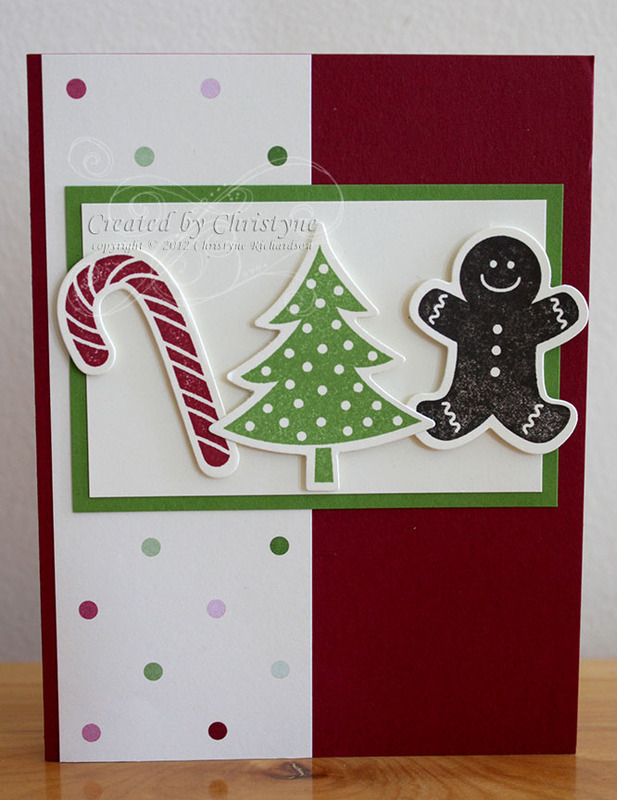 I left out the nautical blue and went with Silver, Red and White for my Christmas card. This set, Seasonal Sayings was just ONE of the gifts I won at the Hamilton Regional, so I decided to ink it up! 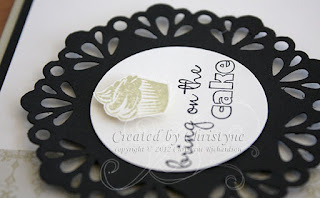 I have to say I quite like it and I'm glad that Stampin' UP! 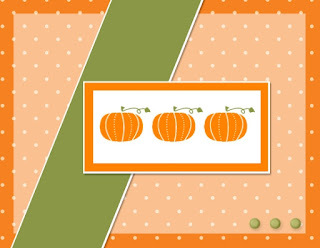 found another Seasonal set after having retired Seasonal Sentiments (which is still available to download as a digital stamp set). 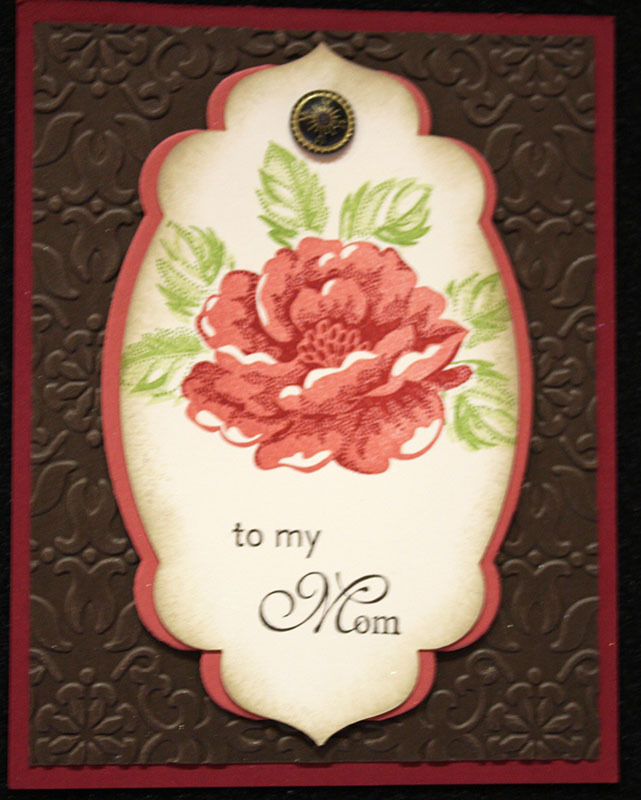 I stamped the image in Cherry Cobbler on Shimmery White Cardstock. You can't really tell in the photo, but the shimmer of the white paired with the silver looks FABULOUS! I added some Cherry Cobbler Baker's Twine for that extra little "something". But I don't even PLAY tennis! HMPH! Yes, I know. The logical part of me knows that tennis elbow is a repetitive strain injury. The petulant child in me, however, is just plain ticked off! It seems my awesome record of posting every day in July has caused me some grief. *sigh* So, I'm on heavy duty anti-inflammatory meds. I SHOULD be wearing a brace and I SHOULD be doing less stamping, but...well...I'm pouting and stamping my feet instead! I knew I wanted to do something "fall", so I started off with a base of Pumpkin Pie polka dots. In order to mute it a bit, I added a layer of Whisper White and reduced the opacity to 50% making it look like vellum. That's one of my FAVOURITE My Digital Studio tricks. 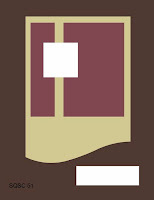 Next I added the Old Olive diagonal stripe and the image panel. When I stamped the pumpkins, they were black so I changed up the colour by using the colouring tool and it was SO fun! And you know what? You CAN go outside the lines in MDS. While I was colouring, I was trying to be careful to not get the Pumpkin Pie outside the outline of the pumpkin. I discovered that it didn't matter. WOOT! So I coloured the pumpkins in Pumpkin Pie and their stems in Old Olive. It took less than a minute! The finishing touch was the brads in the bottom right hand corner. I stayed true to the sketch on this one, so you'll actually be able to recognize it for a change - LOL! ACCESSORIES: It's all digital! MDS baby! While discussing something TOTALLY unrelated, my downline Teresa and I learned that BOTH our wedding anniversaries are this month. 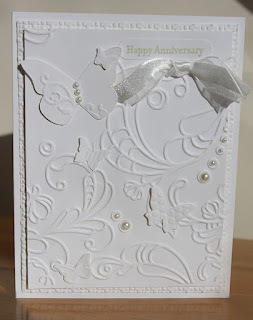 Teresa used the Elegant Lines embossing folder and embellished with LOTS of pearls and the Beautiful Wings Embosslit. I just love everything about it! SO much attention to detail! This week, over at Dynamic Duos, the challenge is a "Black Tie" colour challenge. This means, black with another colour. In this case, it's River Rock. And of course, what's a black tie event without dessert? 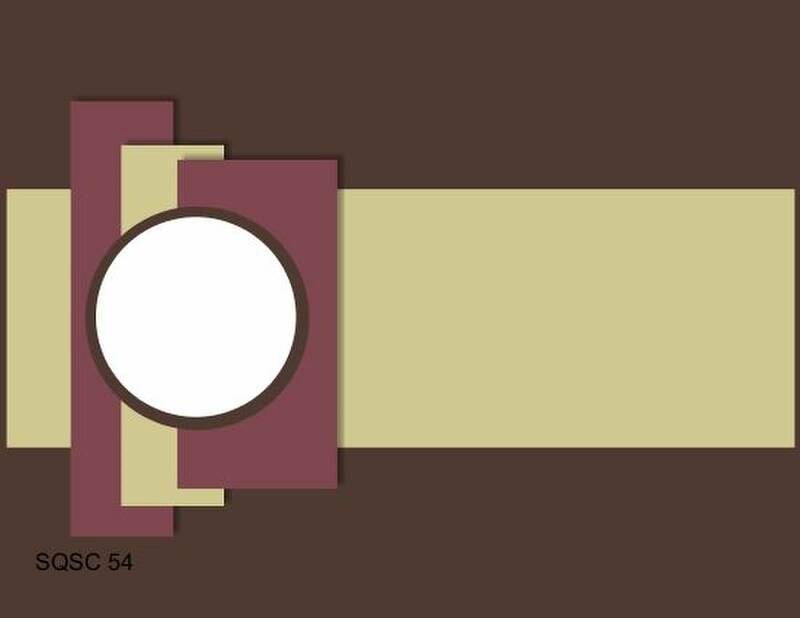 Black Tie colour challenges feature a dessert option - this week, brads! 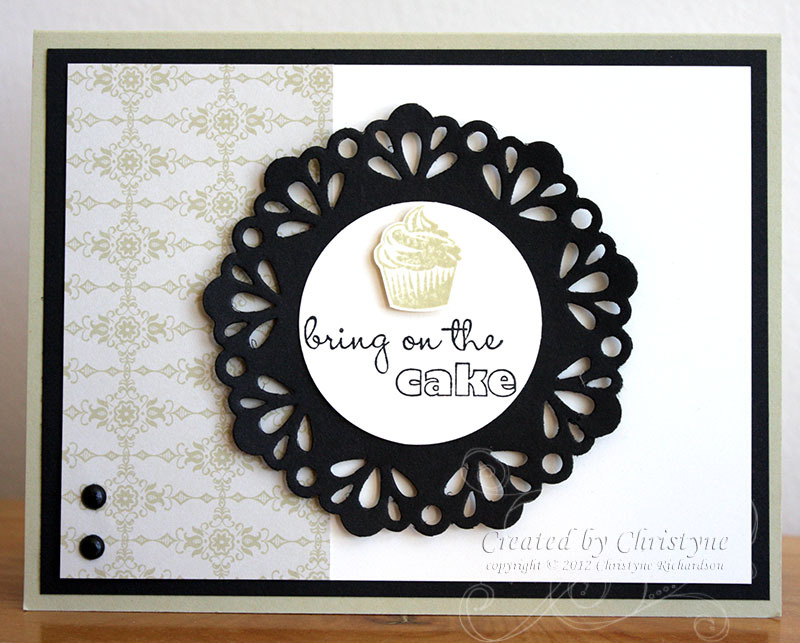 Have you tried out the new Delicate Doilies Sizzlit Die yet? They're just adorable with SO much detail! They can be a bit troublesome, what with all those small pieces, but the end result is DEFINITELY worth it! Isn't that GORGEOUS?? And don't you just love that little cupcake? 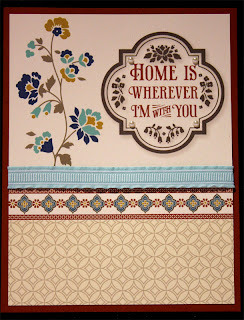 It's from the exclusive hostess set "Carry On", which you can earn by hosting your own workshop. I stamped it in River Rock on Very Vanilla and cut it out before adhering it the card using a Stampin' Dimensional. 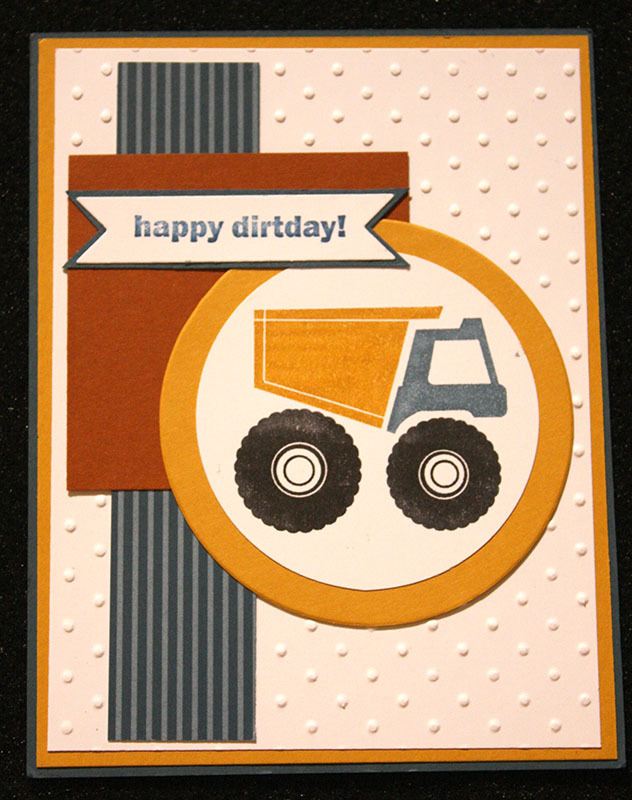 I then adhered the sentiment/image panel to the card front using Stampin' Dimensionals as well. This is just one of the cards we'll be making at my Birthday Card class on September 8th. And don't worry...I'll do ALL the fussy cutting for you! 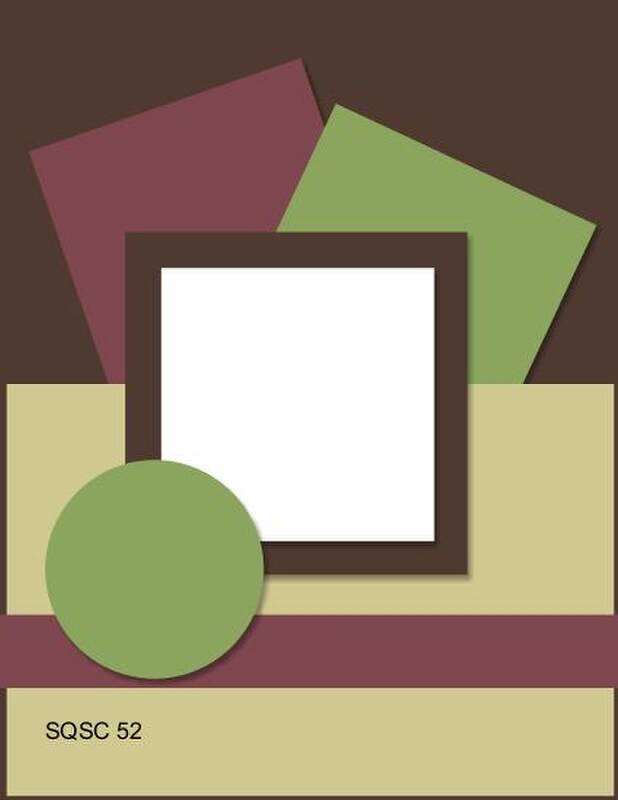 It's Paper Craft Crew Challenge Day! You can check out what the rest of the crew has created by clicking here. It seems the rest of the crew wasn't quite so freaked out with those extra panels! As you'll soon see, I took some SERIOUS liberties with this one! I just couldn't make parts of it work the way I wanted them to, so I took it REALLY basic! Can you at least PRETEND to see the resemblance? LOL!!! Well, that centre square is there...the ribbon that I imagined near the bottom was bumped up and a sentiment replaced it. 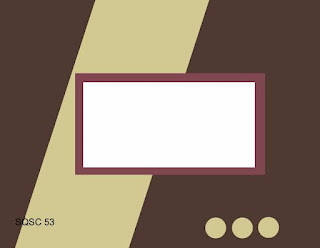 All in all, I like the simple elegance of the card. 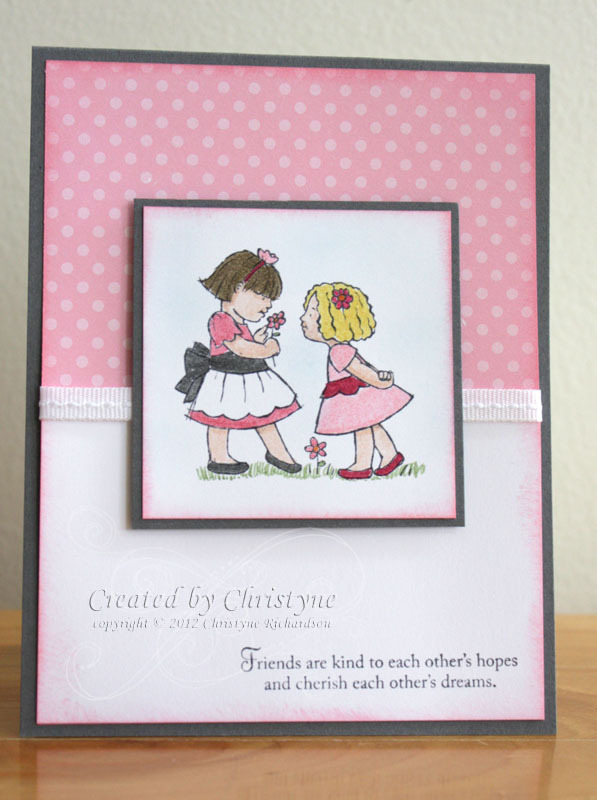 The sentiment at the bottom of the card comes from the set "Cherish Friendship" and was stamped in Basic Grey. Are you ready for a party?? A couple weeks ago, I hosted a workshop for Keely and one of her attendees wanted to make invitations for her son's birthday party. When she's ready to step it up, she'll have some more inspiration! 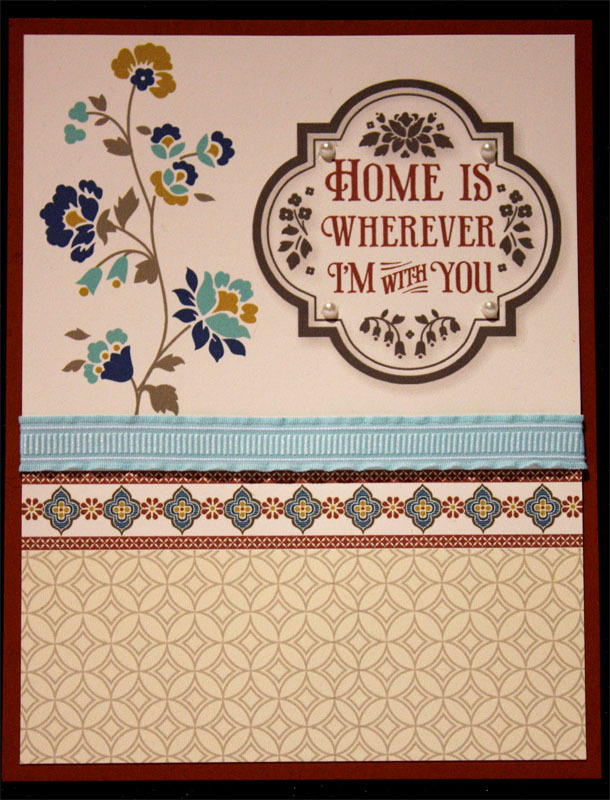 I stamped the banners in Island Indigo on Whisper White and then matted that onto one of the patterns in Summer Smooches before adding it to the Island Indigo card base. The balloons were coloured using markers directly on the rubber. They were stamped on Whisper White and matted on Island Indigo. I then wrapped a short piece of Daffodil Delight stitched grosgrain around the image and adhered it to the front of the card using Stampin' Dimensionals. From the strip of numbers in the stamp set, I used markers to colour JUST the number I wanted and stamped it onto Whisper White. 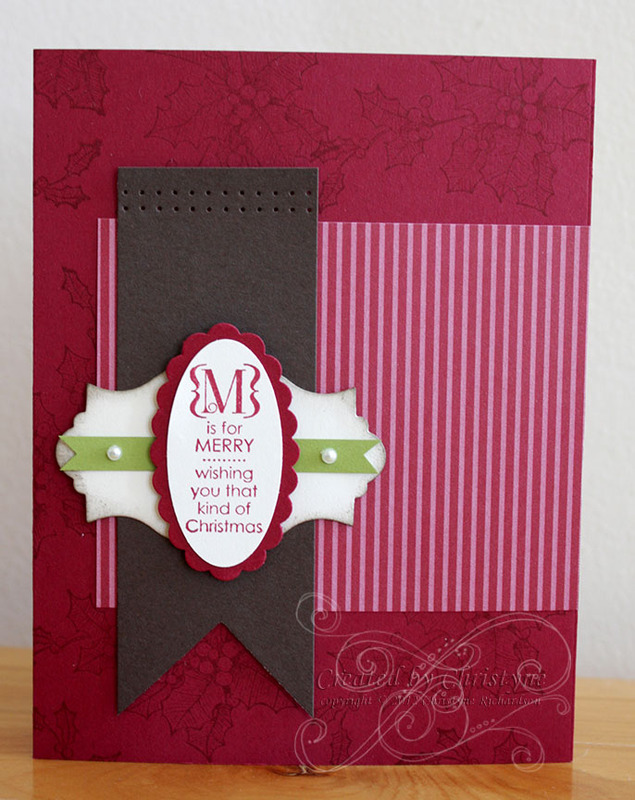 It was punched out using the small oval and adhered over the ribbon using Stampin' Dimensionals. I added Dazzling Details to the flame. 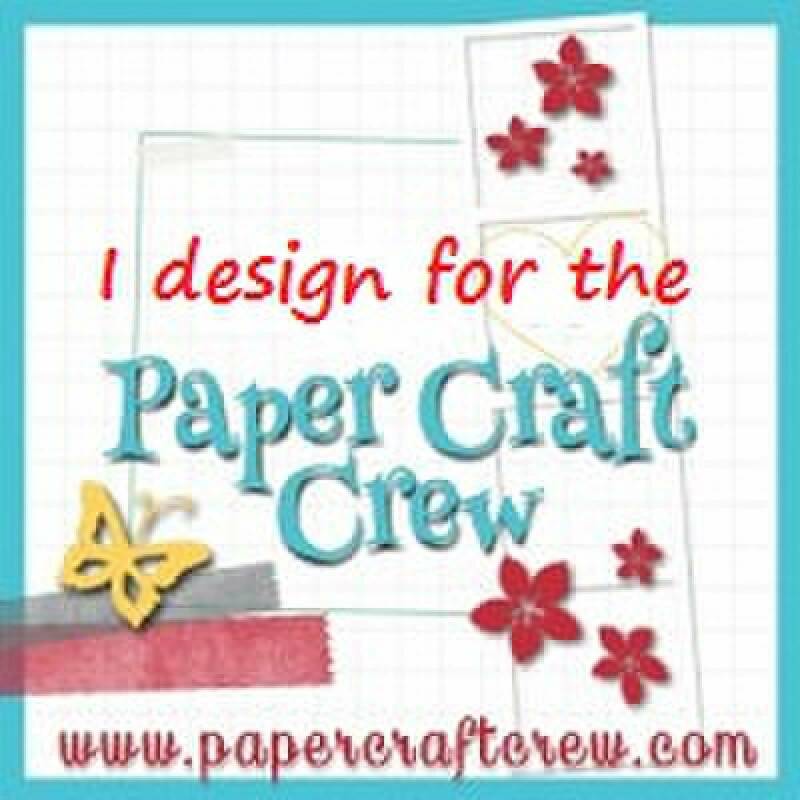 It's Paper Crafts Crew Day! Are you ready to play?? Since you've seen some Christmas in the past few days, I decided to change things up a bit today and give you some bright and cheery! Next, I had to figure out how to make that swoop at the bottom. It was easiest to just hand draw it and cut it out, so I went with that. I then added the layer of Tangerine Tango Designer Series Paper to the Tangerine Tango Cardstock Layer. And then...because I was suffering from "fussy cutting" withdrawal *grin* I cut out the balloon, the basket AND the streamer! 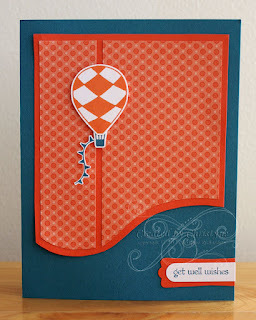 I finished off with the sentiment (from Teeny Tiny Wishes) stamped in Island Indigo on Whisper White and matted on Tangerine Tango. Catalogue CASE goes to Hamilton! I'm SO stinkin' EXCITED!!! Stampin' UP! is doing a Regional event in Hamilton...and it's just 12 days away! Every year, Stampin' UP! puts on a BIG convention in Salt Lake City. 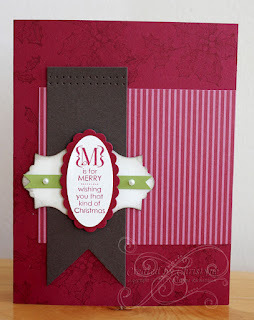 Next year, it's Stampin' UP! 's 25th anniversary and I'll be going - it'll be my first time! 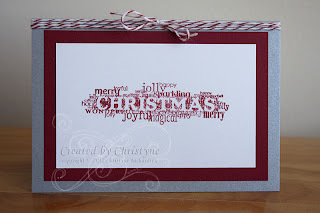 Throughout the year, Stampin' UP! puts on a "travelling show" and hosts regional events across Canada and the US. I went to one a couple of years ago and am SO excited that there's another one nearby. I'm all registered and ready to go! I'm working on my swaps for the event. So far, I have one organized swap done (where a group of ladies decide to swap amongst themselves) and I've done one card for some general swapping. 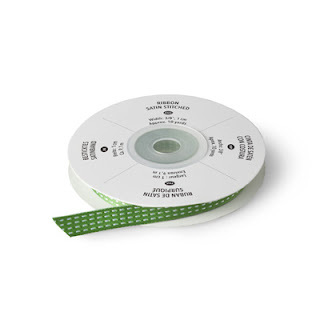 Swapping enables demonstrators to get new ideas and samples for our customers to see at classes. I still have one more organized swap to complete and then if I have time, I'll do some more cards for general swapping. I can't wait!!! 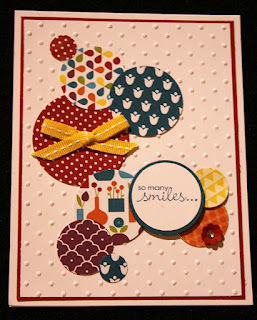 I added Stampin' Dimensionals to pop it up a little bit...and don't you just LOVE those pearls? SO CUTE!!! P.S. It's August 6th! And for now...I'm all caught up - YAY! 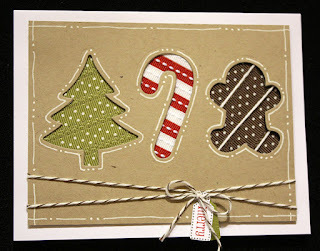 This one uses Jolly Bingo Bits and features another pattern from the Be of Good Cheer paper pack. 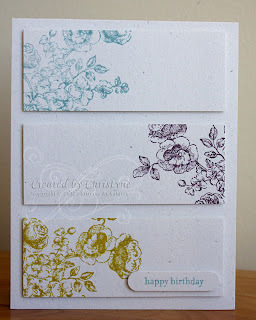 I stamped the images on Very Vanilla Cardstock and punched them out using my 1 1/4" square punch. They were then matted on a pieces of Cherry Cobbler punched with the 1 3/8" square punch. 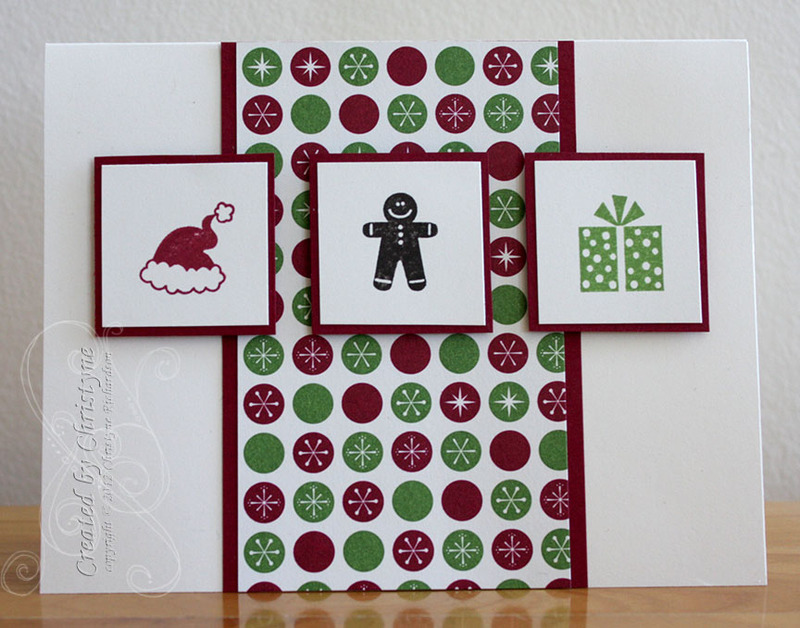 Yes, I KNOW it's August the 6th, but I've got Christmas card classes right around the corner to make sure that all my customers are ready for the holiday! 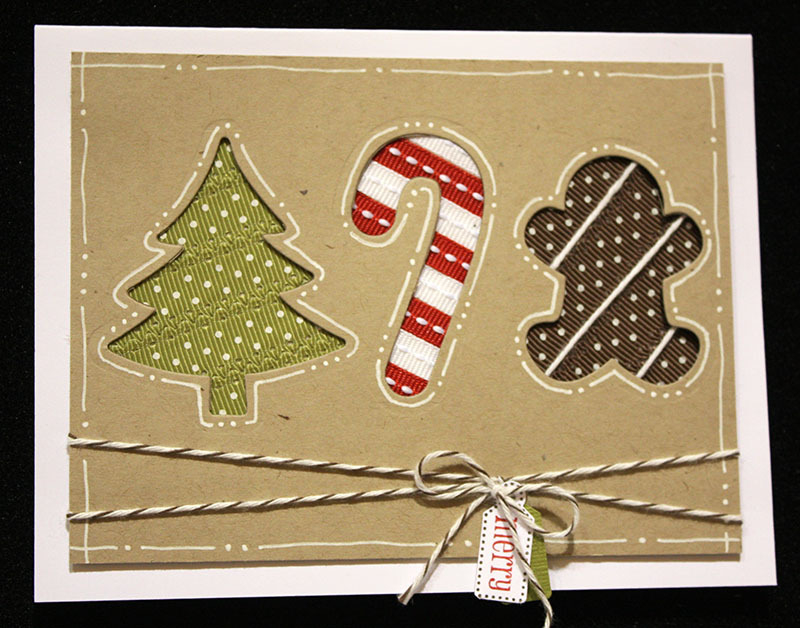 I'm doing 4 Christmas stamp camps (once a month from September to December) and my local customers have the opportunity to sign up for all four classes, get a discount when they do and take advantage of a shopping spree valued at $25 in January! Out of town customers can choose to participate by having all the supplies (minus stamps and ink) sent to them with instructions (instructions are sent via email). The price is the same whether you participate in person or via mail. If you sign up and pay for all four classes before August 25th, you'll pay the special price of $150. This fee is NON REFUNDABLE. 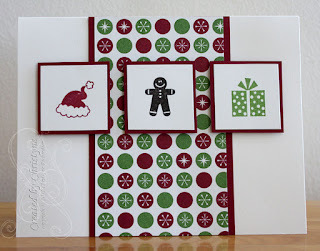 The way Christmas Stamp Camps work: We'll create six different cards at each class, creating three of each for a total of 18. Sign up for all four classes and you'll have 72 cards READY TO GO! 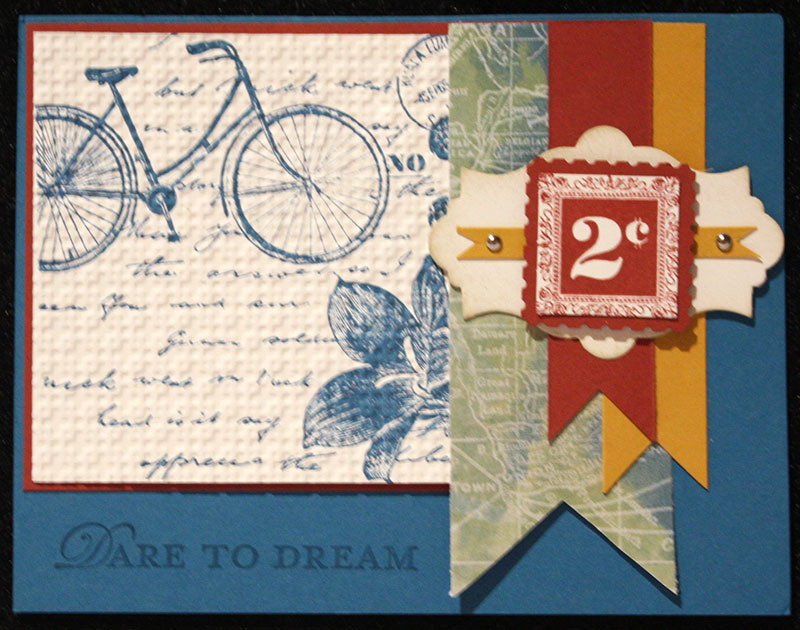 The card above has a matching stamp set/framelit combo in the Holiday Catalogue. MANY of the sets in the Holiday Catalogue have matching framelit sets. You'll have your cards created in NO TIME! P.S. If you're paying attention, you've realized that despite the fact that this post is appearing on August 6th, it's dated August 4th. I'm trying to catch up on my daily posting and my "A" type personality is at work - LOL! SERIOUSLY? How cute is that?? Join my team in August and you can get one of these adorable little projects to complete! You'll get EVERYTHING you need (except ink), INCLUDING the tray!!! Would YOU like to get and make one of these? Easy peasy! Join my team and it's yours! You can get started by clicking here. All the information you need to get started is there and if you have ANY questions, you can always email me or leave me a comment on this post. Be SURE to include your email address in the comment so I can get back to you. Already ON my team? FABULOUS!!! Anyone who recruits this month will be invited with their new downline to a SPECIAL Canadian Blossoms team meeting (date to be announced) where we'll make them all together! Reasons To Stamp and something AWESOME!! Happy August! Can you believe it??? Summer is 1/2 over! Have the kids made you nuts yet? Time to send them outside and get ready to MDS! That's right, MDS2 has JUST been released and you're going to LOVE IT! You can check it out here. And, as added bonus, there's 31% off select MDS downloads and print products!